Feathers were common among dinosaurs, but scientists aren’t certain if the fur-like coverings of pterosaurs—a group of flying reptiles—were of the same sort seen on dinos and birds or something completely different. The discovery of two exquisite fossils in China now suggests pterosaurs were very much covered in feathers, potentially pushing back the origin of this critically important evolutionary feature by 70 million years. Pterosaurs lived between 230 million and 66 million years ago, and they were the first vertebrates to achieve true flapping flight. These ancient creatures lived alongside dinosaurs, and though they’re frequently represented in the media and in film, scientists actually know very little about them. Fossil evidence suggests they were covered in pycnofibres—a fuzzy, fur-like coating—but palaeontologists are divided on whether or not these coatings were similar to the feathered skin coverings seen on dinosaurs and birds, or if pterosaur pycnofibres represented something different entirely. New research carried out by palaeontologists from the University of Bristol, Nanjing University, University College Cork, and several other institutions, now shows that pterosaurs featured not one but four different types of feathers. The new study, published today in Nature Ecology & Evolution, suggests pycnofibres are true feathers, pushing back the origin of feathers by about 70 million years. To be clear, these feathers aren’t like the ones we see on today’s birds. In the case of pterosaurs, three of the four feather types were filament based, appearing as either hair-like structures, bundles, or tufts. The fourth kind was the more familiar down feather. The authors of the new study, led by Michael Benton from the University of Bristol, said the primary purpose of these feathers was to provide insulation, but they could have also been used for tactile sensing, camouflage, and aerodynamics (but not flight). These findings are based on two fossil specimens found at a site in Inner Mongolia—a site that also yielded evidence of ancient lakes, fish, insects, salamanders, and dinosaurs. The two pterosaurs, which date back to around 160 million to 165 million years ago, were chosen for the study because they were exceptionally well preserved and “absolutely covered in fur,” in the words of Benton. What’s more, the fossils were uncoated, meaning scientists hadn’t covered them in a protective coating like a lacquer. “We need a clean surface for our studies,” Benton told Gizmodo. The two species are Anurognathids, a family of pterosaurs. Both are small, likely juveniles, with wingspans no longer than 35 inches (90 centimetres). The two specimens are likely either Jeholopterus ningchengensis or Dendrorhynchoides curvidentatus. The researchers used four different techniques to study the fossils, including conventional microscopes, scanning electron microscopes, fluorescence microscopy, and laser-stimulated fluorescence imaging. Together, these techniques allowed the researchers to study the fine structures at microscopic scales and to peer inside the fossils themselves. Remarkably, the researchers were able to observe melanosomes—a cellular organelle that synthesises melanin pigment—inside the feathers, suggesting these creatures had a ginger-brown colouring. Scientists had previously suggested the existence of only one simple type of pycnofibre, but the new analysis suggests the presence of at least four. The researchers reached this conclusion after focusing on areas within the fossil where the feathers didn’t overlap, and where the feather structures were clearly visible. No anatomical evidence suggesting these structures were somehow different from those of birds of dinosaurs were detected, leading the researchers to conclude a single evolutionary origin of feathers, about 250 million years ago, long before the appearance of birds. These purported pterosaur feathers date back to the Middle Jurassic, about 160 million to 170 million years ago. Some of the oldest-known feathers in the fossil record date back to the same period, but the difference here is that the occurrence of these feathers, and the animals they adorned, were plotted on the evolutionary tree (i.e. a phylogenetic analysis). This analysis projected the origin of feathers back to the common ancestor of pterosaurs and dinosaurs, namely ornithischians (plant-eating dinosaurs) and theropods (two-legged carnivorous dinosaurs and the ancestors of all birds)—a branching that occurred during the early Triassic, around 250 million years ago. Palaeontologist Armita Manafzadeh from Brown University, who wasn’t affiliated with the new study, said the researchers’ approach to studying these fossils was “remarkably integrative,” and a “gold standard” for this kind of analysis. “They used four complementary methods to analyse not only the shape but also the cellular and chemical composition of pycnofibers, giving us a much more thorough understanding of pterosaur integumentary [skin] structures than ever before,” Manafzadeh told Gizmodo. 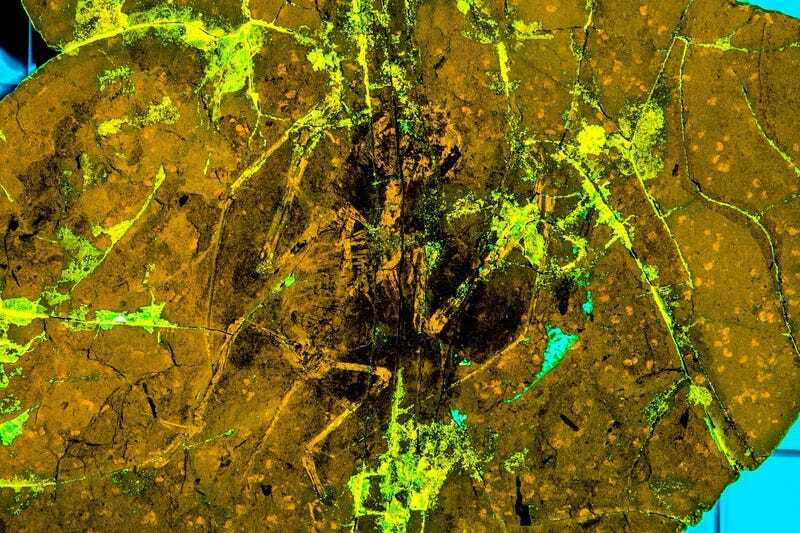 “This work goes to show us that synthesising different methods can help us extract previously inaccessible data from fossils—and also that we still have a lot left to learn about pterosaurs,” she said. Steve Brusatte, a palaeontologist at the University of Bristol who wasn’t involved in the new study, said these two new fossils are “incredibly” important. Benton expects some pushback from his colleagues, but he said his team’s research speaks for itself. If his critics cannot provide answers to any of this, Benton said the simplest explanation is the single origin theory. 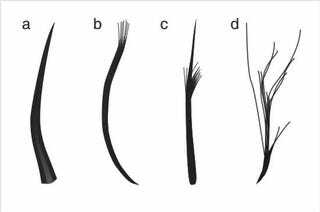 Manafzadeh said this study highlights some striking similarities between pterosaur pycnofibres and dinosaur feathers, but she’s not completely sure these structures truly had one evolutionary origin.